"3LA1, V-1966" by Timothy K. Perttula and Robert Z. Selden Jr.
DECORATION: The rim has two horizontal trailed lines, and five rows of alternate pitched diagonal slashed incised lines. The body has six sets of two stacked and trailed scrolls, each filled with brushing marks. The sets of trailed scrolls hook around each other. 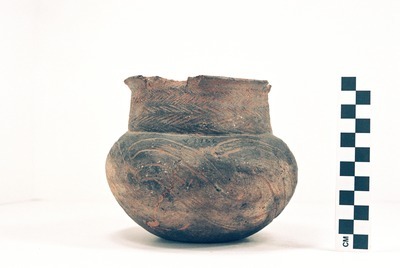 Foster Trailed-Incised or Mound Tract Incised and Brushed jar (5425-653).